Nielsen reads poems he's written over the last 30 years in under 30 minutes, to the soundtrack of his very own paparazzo. (That's host Charles Bernstein in the background snapping pictures.) He explores the genre of constraint poems--one written during a plane ride, others written as a twist on traditional exercises in a grammar textbook. 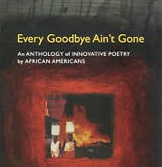 Poetry by African Americans (25 minutes).